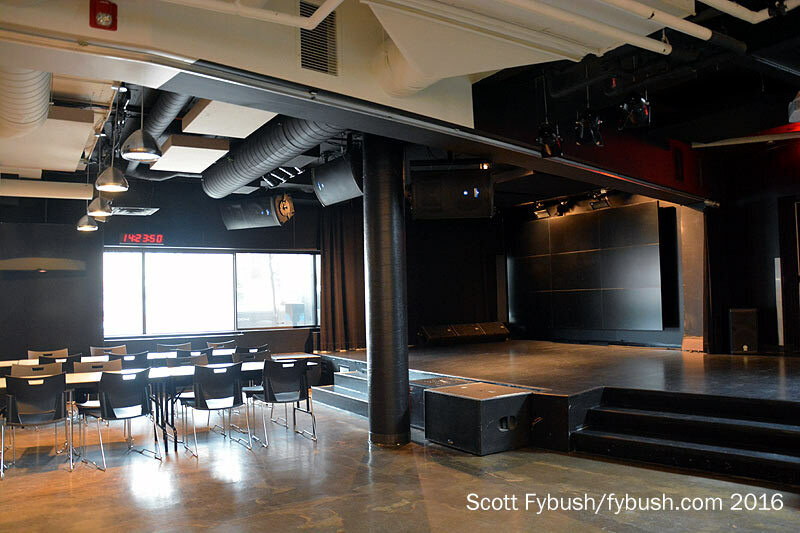 Last week, we profiled the massive Maison Radio Canada, which is Montreal’s biggest broadcast facility, but far from the only one in town. 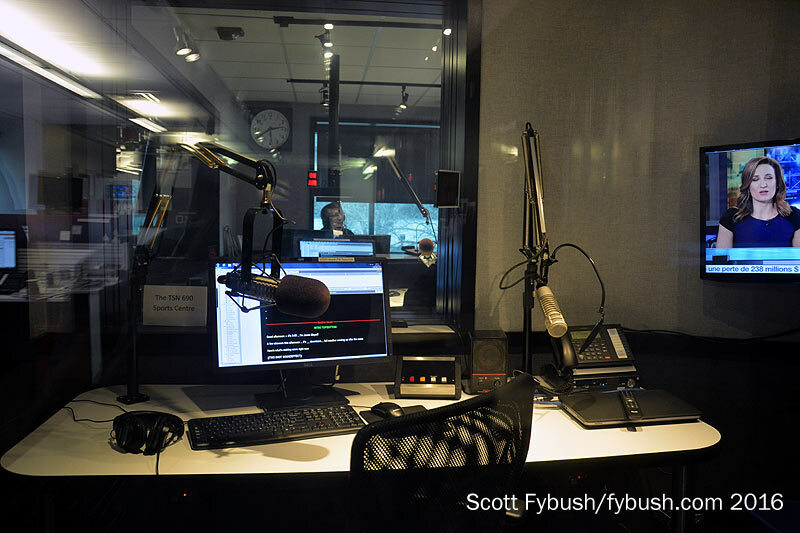 In the four decades since Radio-Canada showed up out here at the east end of the city, the blocks surrounding its headquarters have become home to many of Montreal’s other broadcasters, too. Some of the newer arrivals are just east of Radio-Canada, on the north side of Blvd. Rene-Levesque where it crosses Papineau. 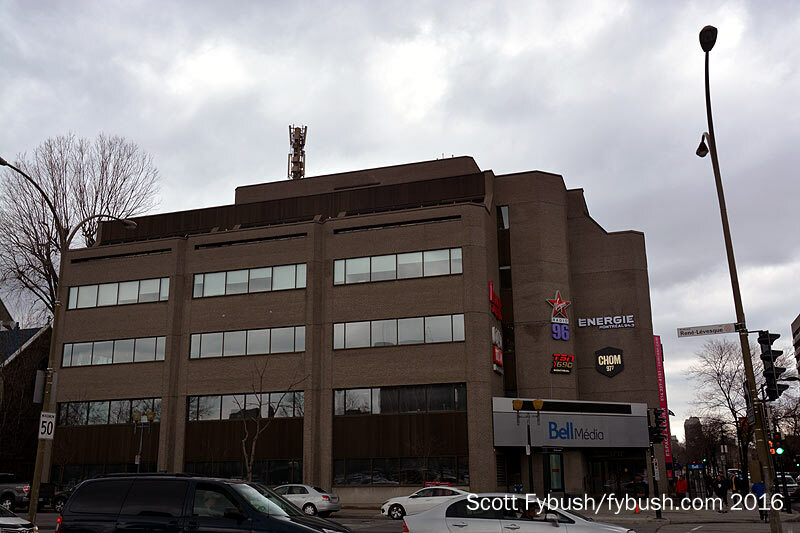 On one side of the street, Bell Media’s radio stations consolidated a few years back into a two-story space – and right across Papineau, another building now houses Bell’s Quebec TV operations, including the RDS sports network and CFCF-TV (Channel 12), Montreal’s CTV affiliate. We didn’t get into the TV building, but we did get a nice tour of the radio operation, which starts on the first floor with a cool glass-enclosed lobby (complete with those neat dome speakers playing each of the radio stations to the seating areas just below) and a big live performance space next to the stairs that lead up to the second-floor studio spaces. 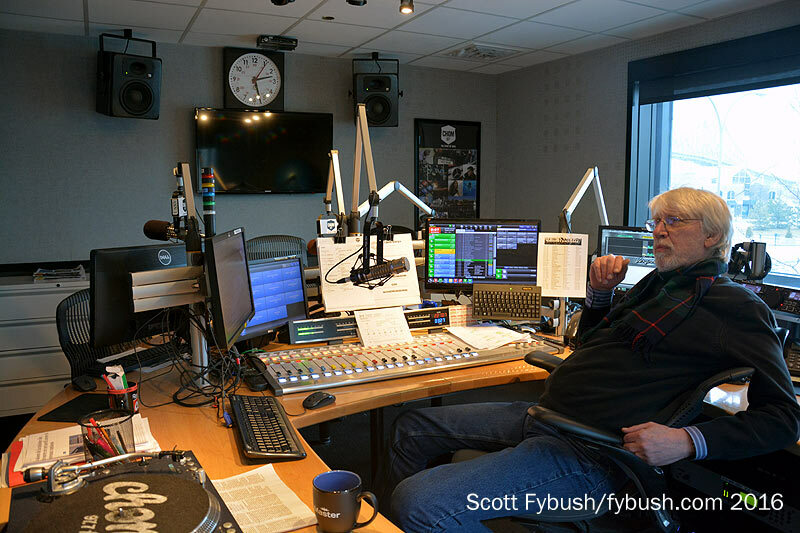 These stations – news/talk behemoth CJAD (800), sports CKGM (690), top-40 “Virgin” CJFM (95.9) and classic rock CHOM (97.7) – were long located in Montreal’s West End, the traditional Anglo part of town. So it was a big deal when they were relocated to the much more Francophone east side, and it was important to preserve as much history as possible. 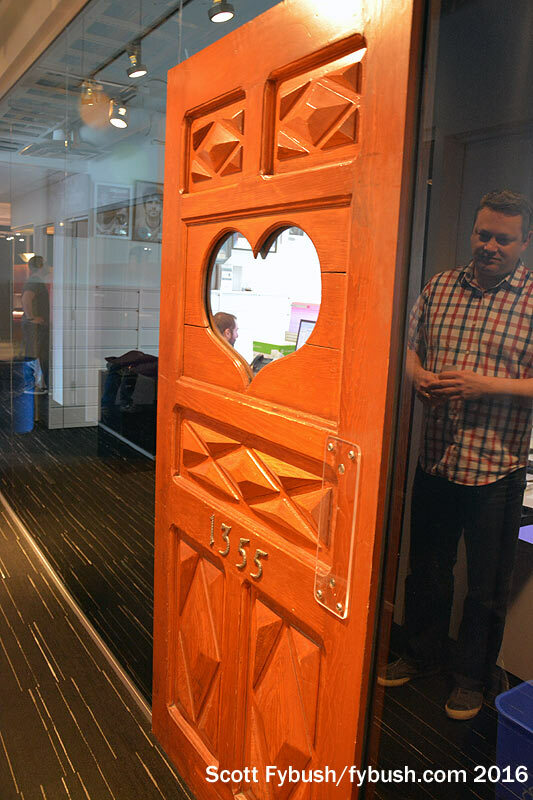 That included the wooden door with the heart-shaped window that started at the original CHOM studio in the 1970s and traveled along to the station’s later Greene Ave. studios in Westmount. 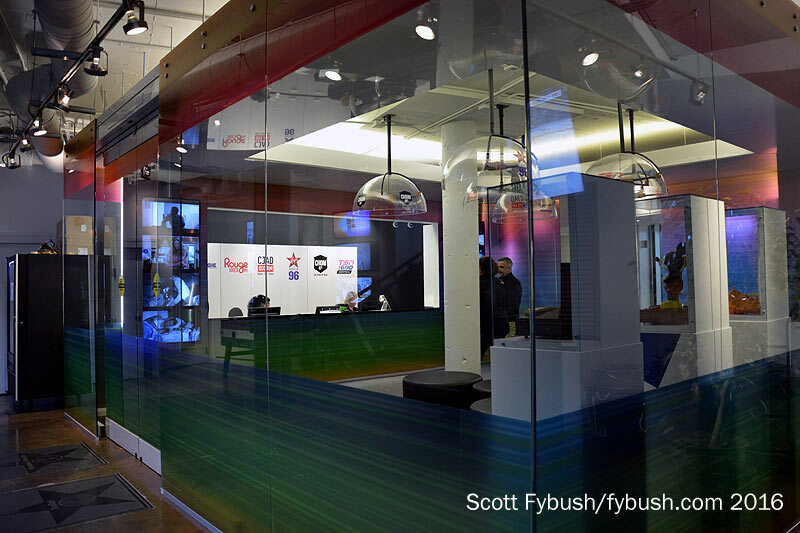 Now it’s fixed into the glass wall that separates office space from the hallway that leads down to the CHOM studios at one corner of the complex. 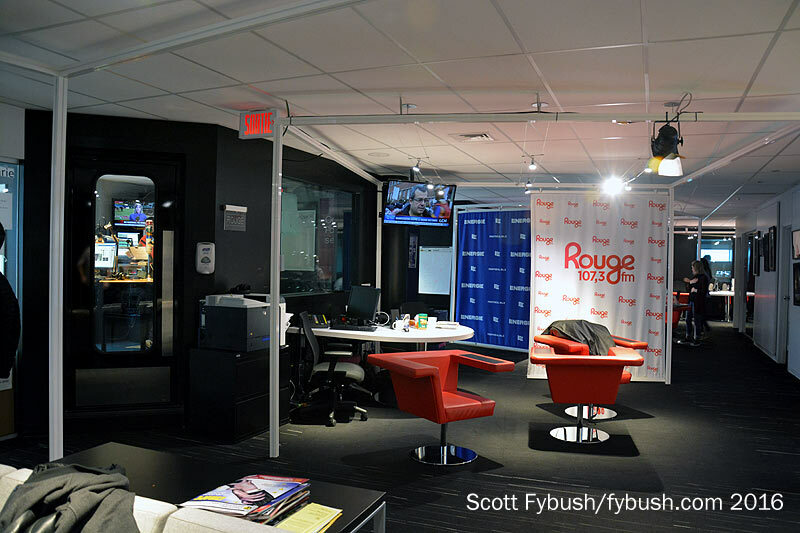 The French-language FMs in the cluster – “Rouge FM” CITE (107.3) and “Energie” CKMF (94.3) – each have similar studio complexes down the hall, including call screening/prep areas outside that look into an enclosed main studio. 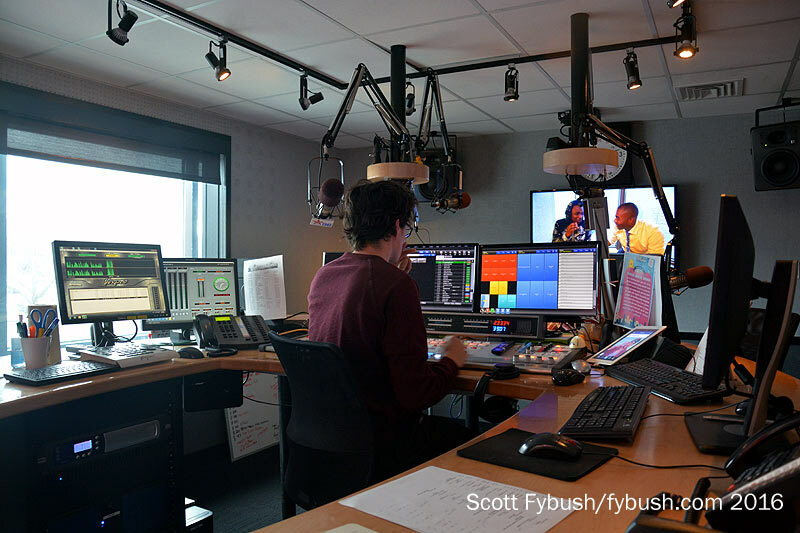 These stations are each the flagships for province-wide networks that take some programming from Montreal and do some locally. 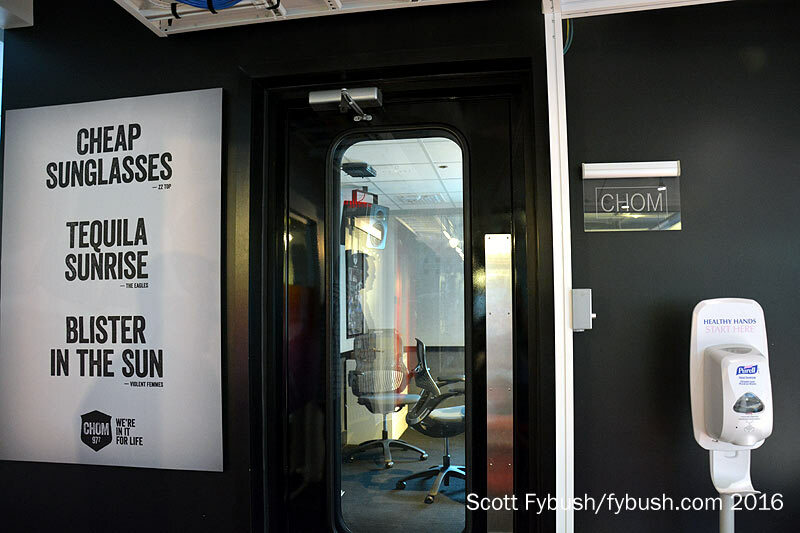 The other English-language FM, “Virgin” CJFM (95.9), is down at the end of the hall with a mirror-image setup to CHOM. 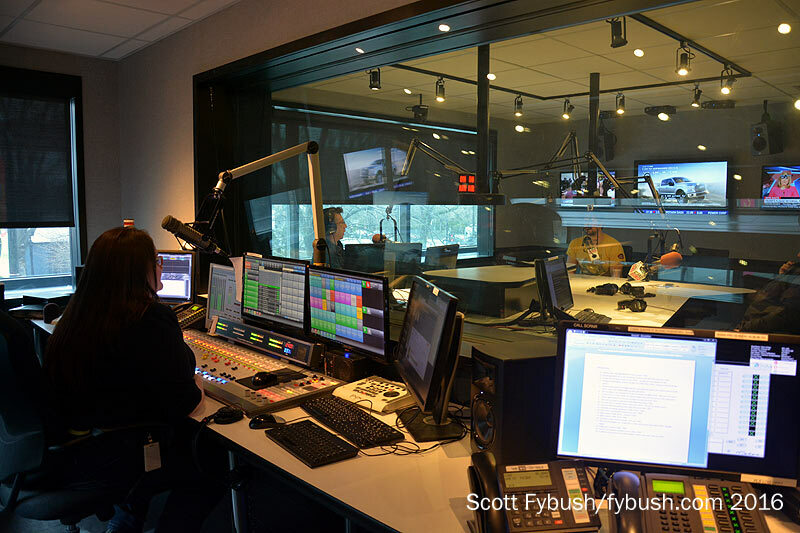 The English-language AMs are around the corner in a studio complex that’s anchored by an open-plan newsroom area that services both the English and French stations here. 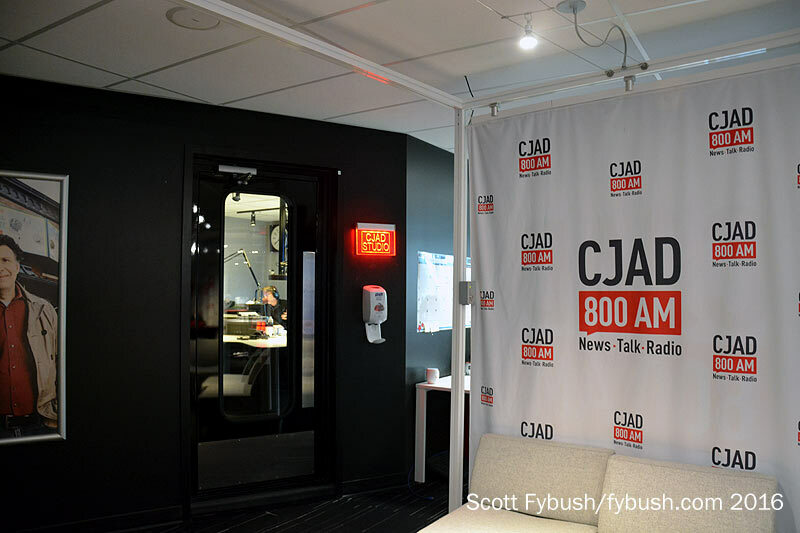 CJAD is the 800-pound gorilla of Montreal Anglo radio, and it gets a studio complex to match, including a spacious talk studio and control room. It’s not unknown for CJAD to pull a 50-share of the Anglo audience here! 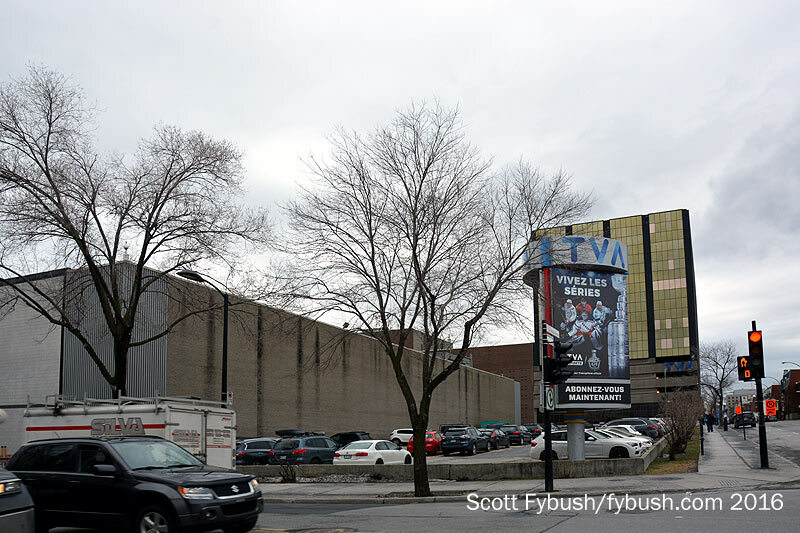 Quebec’s big commercial TV network, TVA, and its flagship CFTM (Channel 10), have a studio complex just a few blocks north of Maison Radio Canada and the Bell stations. We didn’t get inside this complex at Boul. Maisonneuve and Papineau, but maybe next time we will. Rainy weather also kept us from our usual pilgrimage to Mont Royal, the TV/FM transmitter complex that rises just north of downtown. 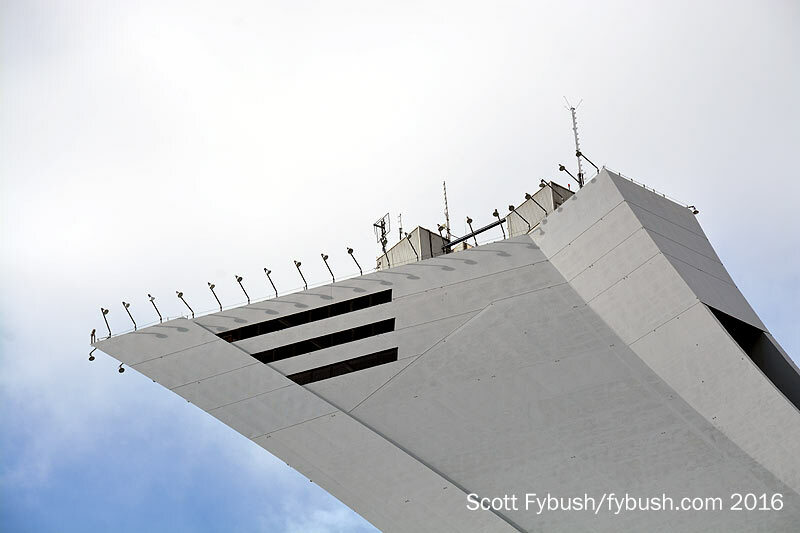 We got a nice view of it from the top of Olympic Stadium (more on that in a moment), but we’ll definitely be back again to get a tour of the inside someday. Downtown, we got what may have been our last glimpse at the other major FM site in town. 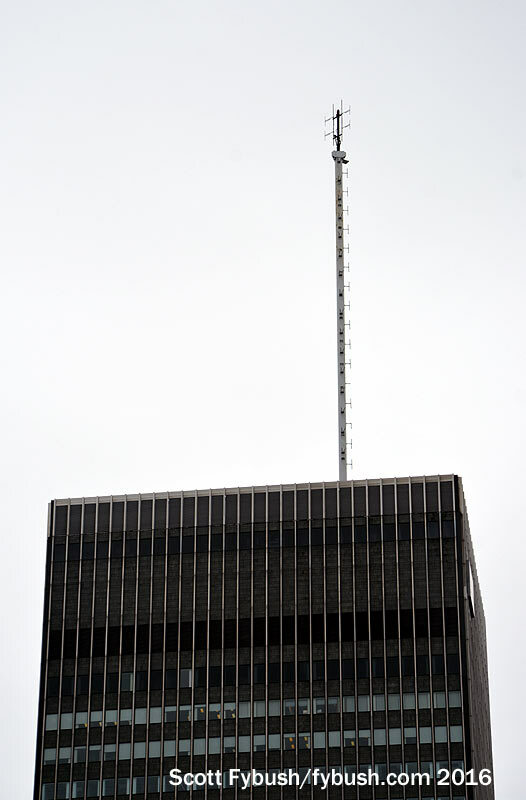 Cogeco’s CKOI (96.9) has long operated from the top of the CIBC building, using 307 kW of superpower from that big vertical-only antenna on the roof. 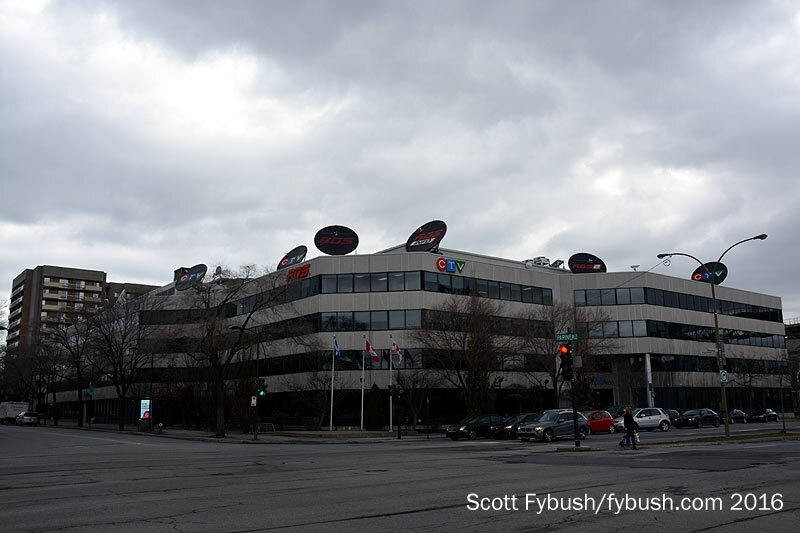 Not long after our visit, CKOI applied to move to Mont Royal, trading some of that power for more height. 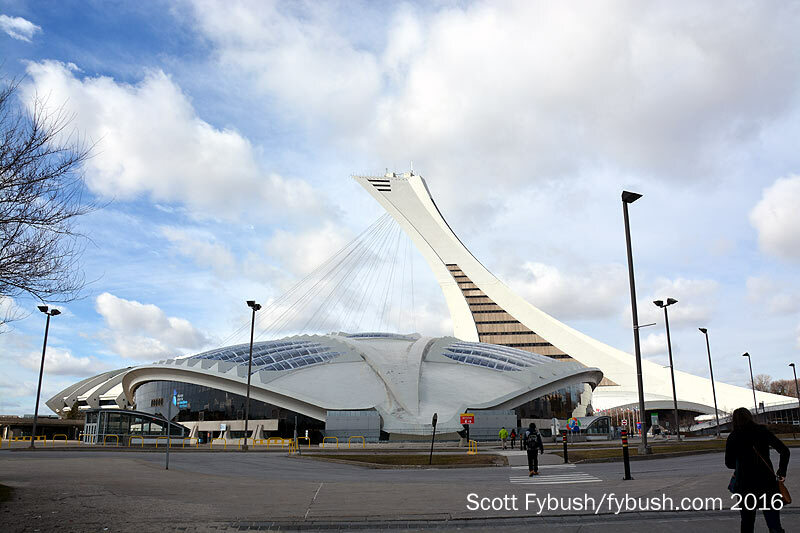 And we leave Montreal with some views from the main reason we were in town in late March: our Red Sox were playing the Blue Jays in an exhibition series at Olympic Stadium, home of the late, lamented Expos. While we were there for baseball, we couldn’t leave without a couple of shots of the FM antennas that perch on the roof of the observation tower: community stations CIBL (101.5) and CHAA (103.3) have their antennas up here. Thanks to Bell’s Matthew Wood for the tour! 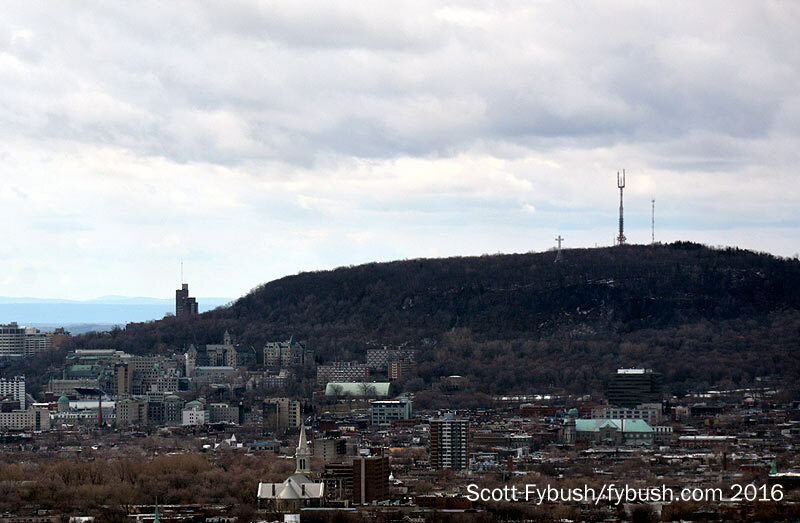 Scott, I think you may find that one of those “FMs” atop the “Big Owe” Tower is in fact the Tele-Quebec TV tower for CIVM-DT.